40 years after it’s founding, Sweden’s search and rescue specialist RECCO is set to take the next big leap by bringing a revolutionary system to mountain and outdoor terrains around the world. RECCO’s beginnings came at the hands of a tragic event. Founder and inventor Magnus Granhed was skiing in Åre in 1973, when an avalanche ripped down the slopes of Svartberget and left rescuers poking the snow debris with their poles for hours, before eventually locating two dead bodies. Magnus thought there had to be a better way, and a few years of research and testing later, the first reflector and corresponding detector were born. RECCO reflectors are passive transponders that consist of two aerials joined by a diode, generating a circuit that transmits at a specific frequency. Once the detector’s directional signal hits the reflector, the diode bounces it back creating a double signal. This principle of signal reflection is referred to as harmonic radarIt allows rescuers to pick up signals from up to 200m away through air (practical reach through snow in an avalanche situation is 20m), a distinct advantage in first arrival rescuing. The system has become a standard tool for more than 850 professional rescue organizations worldwide, as it enables them to pinpoint buried persons faster and in larger areas. This development is complemented by the over 200 manufacturers that integrate the reflectors in their outdoor equipment. Going unnoticed for the most part, due to its size and low-key design, it has become by far the most widespread avalanche rescue system in the world. 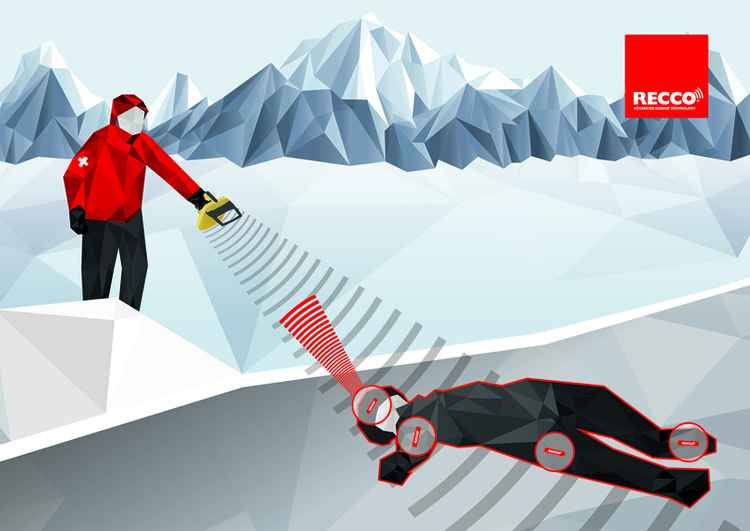 “Our chances to save lives increase dramatically if the victims wear RECCO reflectors in boots or other equipment”, says Bruno Jelk at Mountain Rescue Zermatt, one of the first rescue operations to incorporate the system. In 2015, RECCO announced its new SAR technology, specifically designed to perform rapid searches for missing people in high-alpine terrain as well as lower forest areas and above water. 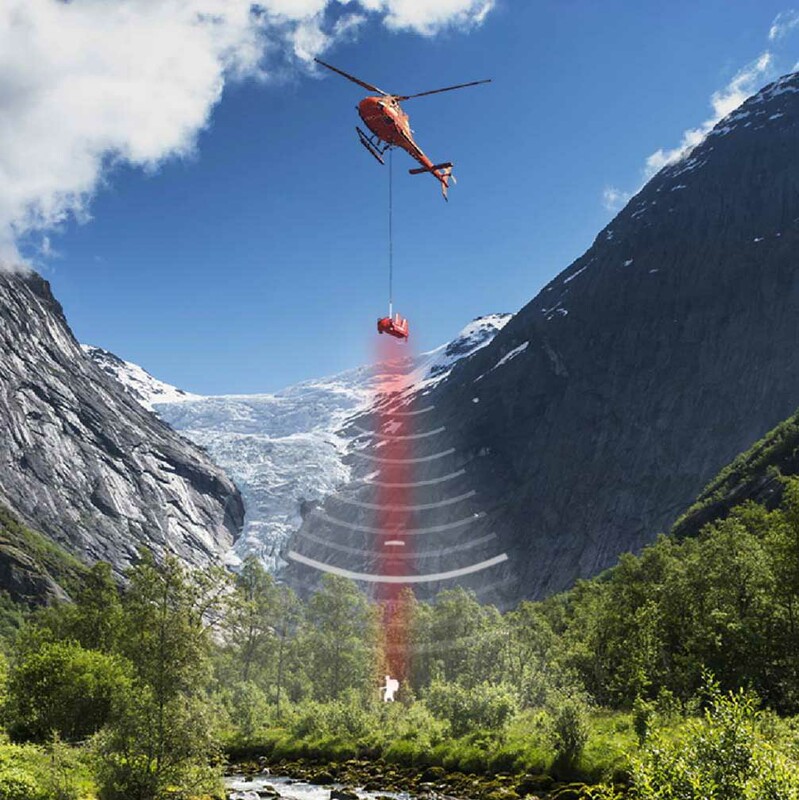 The helicopter-carried detector, now in its 2nd generation, has improved antenna functionality and can search areas of 200m widths at blazing speed, a massive improvement to standard search operations (according to its manufacturer, an area of 1 square km can be scanned in 3-4 minutes). It also enables night-searches by helicopter and makes year-round rescue missions possible. A total of 15 SAR detectors will be ready for use by spring 2017 – in Switzerland and other regions of the European Alps. Despite the obvious advantages of wearing supported gear, it is important to stress that the passive reflectors do not replace knowledge, education or the traditional avalanche gear consisting of transceiver, shovel, and probe used for companion rescue. The functional limitation of this proven, life-saving reflector stems from the need of a special detector and required knowledge of a local rescue team and equipment. Nonetheless RECCO provides a necessary contingency system, that anyone wanting to experience the joys of our inherently dangerous, yet beautifully untamed natural world should take advantage of.